On my daily hike, which I’ve christened the TREASURE TRAIL – I spotted a flash of white at the top of a snag tree. Excited, I crept up the mountain to get a better look. The white flash took off in flight, and soared in circles in the bright blue sky above me. Closer and closer the large white bird flew, until I got a crystal clear view. To my surprise, it was an OSPREY! I’ve never seen an Osprey by the lake before. In fact, I’ve never seen an Osprey “in person” before. Talk about a treasure! I recognized this handsome bird of prey from nature shows; with its bright white wings and charcoal checkerboard markings. 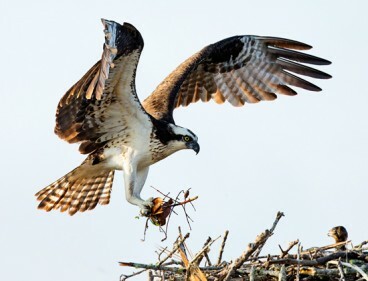 Here’s a fun fact: If one spots an Osprey, it means there’s a nest close by. It also means there’s a healthy fish population close by – and that means the environment is healthy too. Triple-goodness. Who knows what amazing wildlife I’ll be lucky enough to spot next on my Treasure Trail hike. Stay tuned!